Name: Prospero II Acrylic Modern Bathtub 63" - NEW DESIGN! This stunning acrylic modern bathtub comes complete with an over flow, pop-up and drain. The gorgeous curved lines of this piece bring a comforting sense of calmness to your bathing experience. The modern elements and spacious interior form the perfect shape to evoke modern acrylic bathroom design without neglecting functionality. The Prospero II makes it simple to create that spa-like feeling in your own home bathroom d?cor. 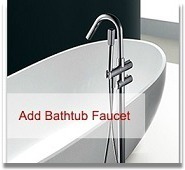 This beautiful freestanding bathtub design boasts trendy elements with not a detail overlooked. The Prospero II freestanding bathtub will be just the perfect addition to complete your elegant bathroom look.